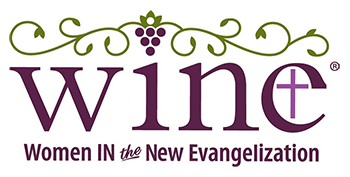 “… THE NEW WINE IS FOUND IN THE CLUSTER"
WINE: Women In the New Evangelization is about empowering women to work within their God-given gifts as women to nurture, heal and build up the body of Christ. Kelly Wahlquist -Author, Speaker, Evangelist, Assistant Director for the Archbishop Harry J. Flynn Catechetical Institute, and Founder of WINE: Women In the New Evangelization. Msgr. Jeffery Steenson -American prelate of the Roman Catholic Church who currently serves as the first ordinary of the Personal Ordinariate of the Chair of Saint Peter, which provides for former Anglicans who have become Roman Catholics. Lisa Hendey – Lisa M. Hendey is the founder and editor of CatholicMom.com and the bestselling author of The Grace of Yes: Eight Virtues for Generous Living, The Handbook for Catholic Moms and A Book of Saints for Catholic Moms. Teresa Tomeo -Teresa Tomeo is an author, syndicated Catholic talk show host, and motivational speaker with more than 30 years of experience in TV, radio and newspaper and spent 19 of those years working in front of a camera as a reporter/anchor in the Detroit market. Teresa is a columnist and special correspondent for the national Catholic newspaper Our Sunday Visitor and appears frequently on EWTN. Dennis Todora – Dennis Todora is a versatile seasoned operating manager, sales leader and consultant with 25 years experience creating top-line and bottom-line results for a private family office, technology and service companies. He has a passion for working with entrepreneurs, consulting with them and turning their ideas into businesses. He is an active volunteer who has served on church, city, and non-profit boards, currently serving on the Board of Directors of The HealthEast Foundation. Nichole Chang – Nichole Chang is the Coordinator of Jr./Sr. High Faith Formation at St. Vincent De Paul’s, serves as Vice President of the Board for Partnership for Youth which hosts 2 Steubenville North high school Youth Conferences, and has been the Liturgist for Steubenville North for 14 years. She is passionate in sharing her Catholic Faith and has facilitated several apologetics and bible studies for women since graduating from Franciscan University with a BA in Theology and a concentration in Religious Education.